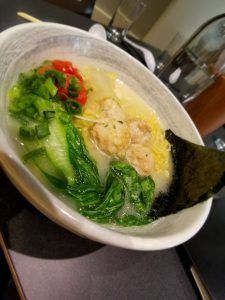 The much anticipated open of Crane Ramen in the 5 Points area of Jacksonville, happened without much fanfare on a Wednesday night and within the hour the house was full. 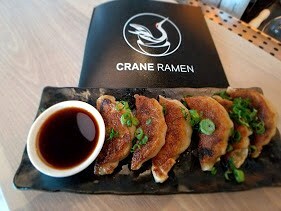 Cranes reputation precedes it due to the popularity of the Gainesville location, and in the food community here in Jacksonville the word spreads like wildfire. Lucky for me because of my proximity to the restaurant I managed to have a sneak preview and ever grateful I am, to owner Fred Brown for the opportunity. Let’s look at the menu offerings I sampled. My first choice the pan-fried Pork Dumplings, nicely browned but not so much it dried out the skin. The stuffing was moist with well-flavored meat, served with a soy-based dipping sauce. These were top notch. 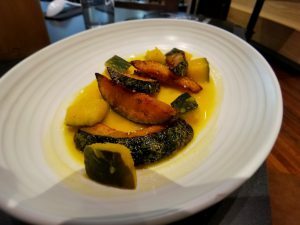 My second choice a new item for me Roasted Kabocha Squash, with a meaty texture similar to a Hubbard but somewhat sweeter, with a nutty flavor; I was thankful it was cooked al dente as I like my veggies firm. I sampled two types of Ramen first was the light and flavorful Paitan, consisting of a creamy ginger-scented chicken broth, chicken meatballs, bok choy, with over-roasted tomato, soy-marinated egg, pickled onion, nori, and scallions. I am a big fan of anything containing ginger, so this dish was well appreciated. My next choice took me in an entirely different direction. I enjoy milder flavored foods, yet tend to gravitate to anything that has the five pepper icon next to the name. 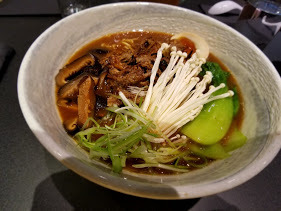 This Spicy Pork Shoyu Paitan delivered the heat with the well-balanced ingredients of soy sauce, the thick and creamy Paitan-chicken broth with a habanero kick, was perfect. The soup topped with chopped pork, soy-marinated egg, enoki mushrooms, sweet shitake pickle, bok choy, and scallions is the perfect example of craft ramen. 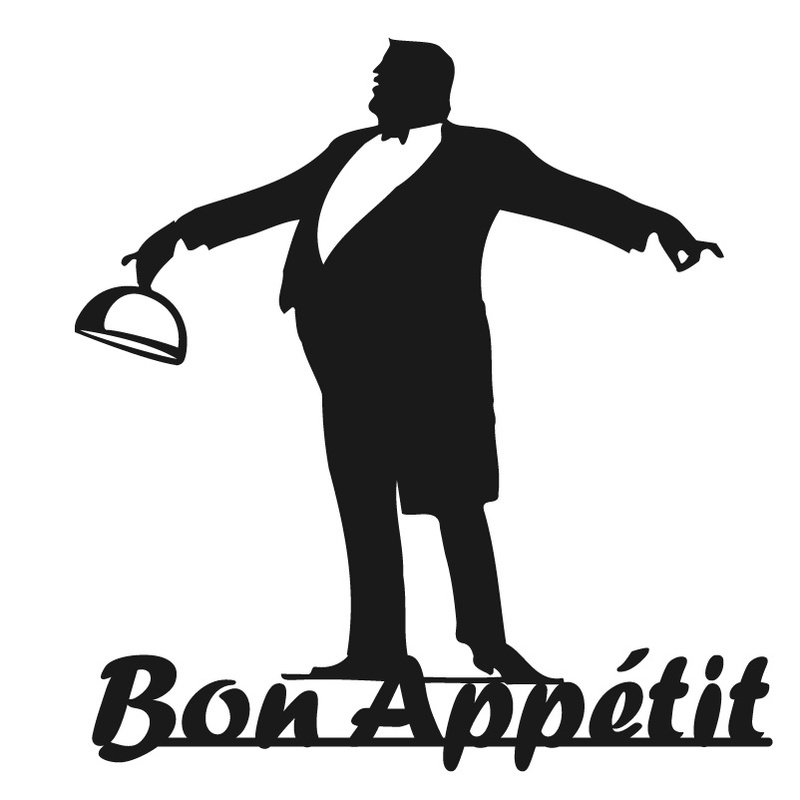 I am happy to say I have been back on two other occasions and found the service efficient and the staff knowledgeable for a newly opened restaurant. The team did their homework and managed a house full of hungry patrons like the pros they are. I wish you to best Crane Ramen.